I don’t know how I missed the boat on the original shades of Buxom Stay-There Eye Shadow, but man I missed out. I love the look, texture and feel of cream shadows but have always hated how they slid off before you could even blink. Not so with Buxom Stay-There, totally not the case at all. When I went to San Francisco, my Buxom PR friend slipped me the four shades above before they had even hit shelves. I of course immediately wore them while in San Francisco just to see what they were all about. They are light weight, creamy shadows with the perfect amount of shimmer. You can layer a single color to really build up the color or you can layer different colors to create a great smoky eye or other playful eye effects. When I wear any eyeshadow I start with an eye primer – an essential base in makeup prep. And since I’m already using a Bare Escentuals product, when I wear the Stay-There Shadows I tend to put on Bare Escentuals Prime Time primer as my base and my shadow lasts and lasts and lasts. I also prefer applying my cream shadow with a flat brush instead of my fingers, don’t get me wrong in a pinch fingers work but brushes are always best. Since I fell in love so hard with the formula of the Stay-There Shadows, on a recent trip to Sephora I decided to pick up one of the original shades, Saint Bernard, a gorgeously vivid teal. And since I’m always asked about how to wear bright colors to work and when to wear them, I thought I’d show you a look combining 2 Stay-There Eyeshadows, a Buxom Liner and lots of mascara. This was my makeup look for work today. I’ve been wearing this combination a lot and honestly, I pair this color palette with anything. I’m of the “wear whatever makes you happy” makeup family. I’m wearing a fairly neutral outfit (I’ll post that later): navy sweater, white top, brown slacks and snake skin and silver accessories. 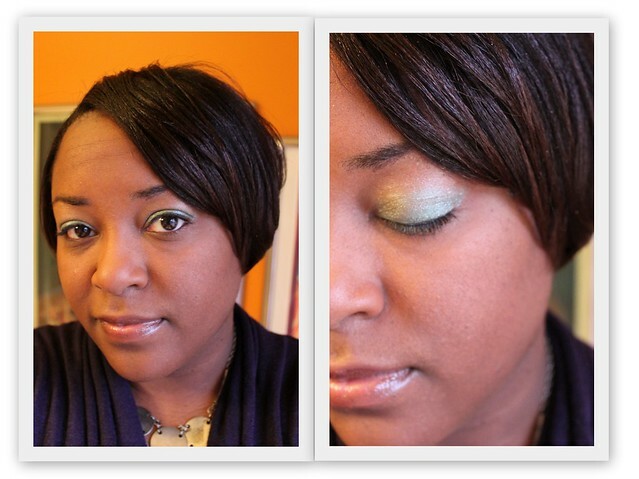 Since my clothing color palette is so neutral I figured why not give my eye makeup a great burst of color? And this picture doesn’t do Saint Bernard any justice, it’s much brighter than this, which is why I love it so. Using a flat shadow brush I applied Collie, a shimmer beige neutral, as my base from my lash line to above the crease and then applied Saint Bernard from the lash line to the crease and blended. Then to really help make the green shade pop, I lined just the top line with Buxom Liner in Leatherette with a very skinny brush. And of course I applied lots and lots of Buxom Lash mascara to give my lashes a great glossy black shine to them. I applied just a soft sweep of a pink blush and champagne colored lip gloss so that my eyes were really the focus. I’ve been doing this combination at least 3 times a week for the last 2 weeks. I think I might be addicted to Stay-There Eyeshadow. So have any of you tried Stay-There Eyeshadows? Or cream shadows in general? What did you think? I love these colors! I’m not sure if with my skin tone I could pull off the green shades but I love the idea of trying. 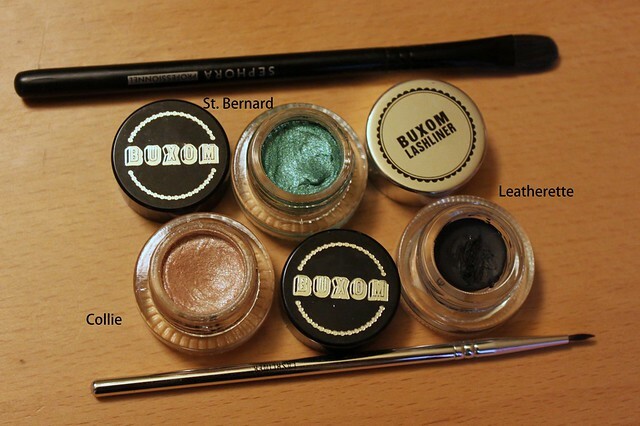 I may be checking out Buxon eyeshadows soon!!! Thanks for posting. Can’t wait to see the outfit too. I bet it’s cute and stylish!! Okay, I splurged and bought Golden Retriever and Collie! YAY!!! Can’t wait to try them out. Thanks for the awesome tip. I LOVE these shadows too! And this comes from someone that HATES cream eyeshadows. I usually just don’t like the way they feel but the Stay-There eyeshadows feel so different and really stay put! I actually wore mutt all over my lid last summer one day that I went swimming and it still stayed! @Belle these cream shadows are AWESOME!! Glad someone else can back me up. @SWFTerra oh thanks for saving divine 🙂 I do high and low beauty stuff but these cream shadows are nothing short of amazing. I received my Collie and Golden Retriever shades in on Tuesday and have worn them yesterday and today and I do love them!! Thanks for sharing this find with me!